72" x 36" x 1/4"
No more confinement! Yoga Direct's Extra Wide Yoga Mat allows you to spread out and strike a pose without worrying about spilling off the sides of your mat. 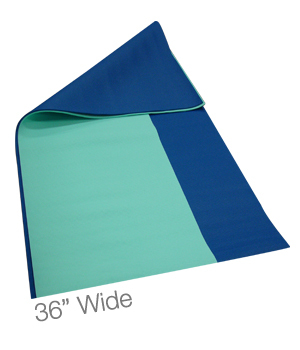 Our extra wide yoga mat is 36" wide...a full 12" wider than a standard sized mat. It's also extra thick (1/4") for your ultimate comfort. Choose from classic colors. Our 1/4" thick Extra Wide Yoga Mats are great to have available at your studio or gym to accommodate different sized Yogis, as well as for use in Partner or Acro Yoga classes because they occupy a larger area of space on the floor. Made of durable foam with a high-tack surface for stickiness, this mat is wider than most mats, and is contructed of the highest quality materials available. The Extra Wide sticky yoga mat is machine washable and as with all of our Yoga Mats, these mats can be easily stored, cleaned, and rolled up after class. Each Extra Wide Yoga Mat arrives individually wrapped, and can also be custom printed or branded with your own company or studio logo or design. This is an awesome yoga mat for an awesome price. Based on my searches, this is the best price for a mat of this quality. I love it! It's cushy, it's large enough that I never hang off the mat, and it's a rich beautiful purple. Couldn't be happier with it. This is the first mat that I've purchased. The place I practice yoga provides mats, but they are thinner and smaller than this one. The extra thickness of this mat really helps cushion my knees and I'm 6'2" so the extra length and width are very nice. I can finally lay flat on my back and my feet don't hang off! These mats are the perfect size for what I do. They are somewhat heavy, so I will need a carry strap or bag. Also fresh out of the packing there is an intense smell, but it dissipates after a few days. Finally, a yoga mat big enough so my feet and hands aren't hanging off the edges! And it's got excellent traction too.! I bought this mat because my $100 mat was just wide enough for my knee to fall on the edge in some poses--very painful. Yogis above 6 feet tall have probably felt the same pain. This mat will take care of that. While it's not very thick compared to some, and you will definitely slide when you sweat, for the price it's perfect. My Wife loves the extra wide Yoga Mat . It just right for her. She is a vey small framed Asian women , she is more comfortable with this wide mat , then a standard mat . Perfect for practice! Nice thickness, all in all a great mat. This mat is a great value for the price. It is nice and big and light for carrying to classes. Highly recommend to anyone who needs a little more space. Happy purchase. I bought this for my boyfriend because obviously for the extra size and so far no complaints. I plan to get one for myself just because the classes I take are so crowded this mat makes a harder for people to crowd your space. And since the classes we take are more bootcamp style this allows you to stay on the mat the entire time.